Folks, check this li’l card out! 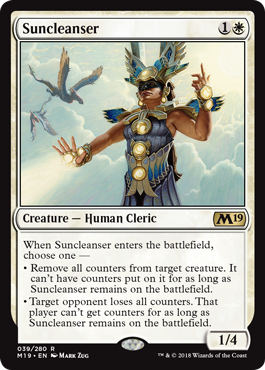 It’s a real doozy, doing something no other card we recall doing – take a listen or watch and hear all about the Suncleanser! Wizards gave us this card to share with you, our listeners, and the wider world. We would be incredibly grateful to all our visitors if you contributed a buck a show – that doesn’t cost you much, but it means a lot to us!